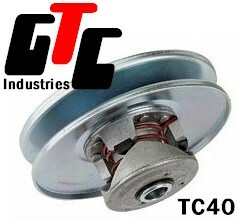 The model GTC 40 is a Mid-Range Torque Converter designed for applications upto 18 Horsepower. The GTC 40 is appropriate for applications requiring more torque than GTC 20 or 30, but below the requirements of GTC 94 or 102. Unlike the GTC 30 TC2 Kits which install with a mounting plate bolted onto the engine, the GTC 40 requires the use of a Jackshaft on the vehicle for installation. 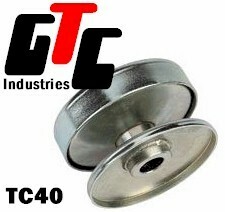 The GTC 40 is a heavy duty, high quality Torque Converter built to withstand tough applications. *Note: COMET and TAV2 are trademarks of Certified Parts Corp. GTC Industries is not affiliated or associated with Certified Parts or its products in any way.